With HDR playback support and Panasonic's Firefox smart system, and delivering mostly impressive performance, the 50DX750 is a great-value TV that will look great in any room. No sooner have we got used to talking about 4K Ultra HD TVs than another potentially game-changing feature has come along. Called high dynamic range (HDR), this new feature introduces more brightness and colour to pictures and it's complicated and challenging from a technological point of view, but also, completely capable of transforming your TV viewing experience. Despite only costing £1,299, the Panasonic 50DX750 supports HDR as well as squeezing 4K's 3840x2160 resolution into its 50-inch screen. So, on paper at least, it's a hugely appealing prospect for AV fans looking for a future-proof TV solution that doesn't cost the earth. While your eyes might focus on the screen, the DX750's design catches the eye in all the right ways, too. Its slender frame boldly eschews the current penchant for blackness in favour of a glinting silver finish that combines simplistic harmony with the innovative desktop stand design. This stand can be fitted in no less than four different ways according to your tastes and needs. The legs can have their curved parts facing forward and their sharp bits facing back or vice versa, and they can be fitted either towards the centre of the screen or at its extreme corners. It's not quite a bespoke solution, but any sort of customisation is appreciated. Spin the 50DX750 around and it looks just as good. It delivers four HDMIs, for starters, when I'd only expected to find three given how affordable the set is for the technology it offers. Two of these HDMIs support the HDCP 2.2 anti-piracy protocols and 60/50Hz 4K playback of the latest HDMI standards. There are also three USBs for playing back a good selection of photo, music and video multimedia files or recording from the TV's Freeview HD tuner to a USB HDD. Plus you get the now inevitable integrated Wi-Fi and Ethernet network options. The Wi-Fi/Ethernet options include streaming from any external DLNA-capable devices you may have on your network, as well as brokering a connection with your smart devices for sharing content from them or controlling the TV through them via Panasonic's TV app. The network options also, of course, enable the 50DX750 to connect with Panasonic's ring-fenced world of online content (or explore the World Wide Web if you really want to). This content is reasonably expansive now that Panasonic has ditched its old proprietary online system in favour of a version of Mozilla's Firefox system specially designed for TV use. As usual, though, I found during my tests that I only really used a handful of the available apps, chiefly those built for video streaming - in particular Netflix and Amazon, which are here provided in their 4K streaming incarnations. It'd be nice to see a more diverse crowd of apps, but what's here will suffice for video streaming. The 50DX750 is also equipped out of the box with the Freeview Play catchup TV platform that lets you stream shows you might have missed from all of the TV's 'big four' broadcasters. You can even search for such content using an electronic programme guide that covers the past seven days of the TV schedules as well as the next seven. Perhaps the single best thing about the 50DX750's expansive and useful set of smart features, though, is that they are all martialled through Firefox's excellent onscreen menu system. This is an attractive, sensibly organized and intuitive way about focusing on the sort of content most TV users want while keeping it easily customisable. It's a genuine rival for LG's excellent webOS interface and the perfect foil to the overbearing clutter of Android TV. I've already mentioned the 50DX750's key screen features of a native 4K UHD resolution and support for the new high dynamic range (HDR) format. But the latter needs more explanation. HDR isn't binary – it's not as simple as saying "yes it has it," or "no it doesn't" – we're also dealing with the level of HDR performance it delivers. For instance, while Panasonic's first TV of 2016, the 65DX902, met the so-called 'Ultra HD Premium' specifications for 4K HDR recommended by the AV industry's Ultra HD Alliance, the 50DX750 does not. And it falls short for multiple reasons. First, it's only an 8-bit screen, not a 10-bit one. Some would argue that this makes it debatable if the screen can even be called an HDR one, but I don't subscribe to that view for the simple reason that when it receives an HDR source the 50DX750's images clearly enjoy a signficant colour 'uplift' from the way they look with standard dynamic range content. The 50DX750 also doesn't hit the 1000 nits of brightness required to meet the Ultra HD Premium recommendations. But before you call Panasonic an outright liar, the DX750 does still use bright panel technology that makes it comfortably brighter than the 350-500 nits you generally get from TVs that don't support HDR. On the colour side of things, Pana's latest still uses wide colour gamut phosphors to help it cope with the expanded colour range associated with almost all the HDR content we're seeing (though it doesn't deliver as much of the DCI-P3 digital cinema colour space as the 65DX902 does), while a degree of local dimming applied to its edge LED lighting engine should help the screen produce the sort of extreme contrast range HDR playback demands. While I'm on the subject of HDR and colour, I should point out that 50DX750 does not support the Dolby Vision HDR system. In fact, the only brand in the UK supporting Dolby Vision right now is LG, with its imminent SuperUHD LCD and new OLED TVs. It's not all bad, though. The 50DX750's picture quality will hopefully benefit from the set's powerful 'Studio Master HCX' video processing engine. This delivers, among other advantages, a reported 1800Hz motion effect (delivered via a combination of frame interpolation and backlight manipulation) that should keep LCD's issues with motion blur and judder to a minimum. Another advantage is that it also delivers extremely careful control over the image's colour and light elements. In practice that means that the DX750 attempts to deliver pictures that look as close as the TV can get to the way their creators intended them to look. This 'director's intention' aim applies to both HDR and SDR content, though there are various 'remastering' circuits on hand to try and bring SDR up to the something approaching HDR if that appeals to you. The 50DX750's picture circuitry has been developed with the assistance of Panasonic's Hollywood Laboratories. However, unlike the DX902 this mid-range model, it doesn't boast a picture preset calibrated by colourist Mike Sowa, or THX certification. One last key feature of the 50DX750 is its 3D playback ability. 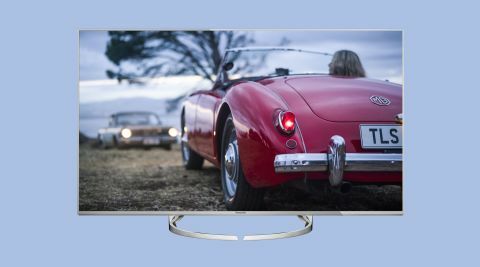 This uses the full HD active solution, and takes on extra significance this year given that both Philips and Samsung have announced that none of their 2016 models will support 3D. The bad news? You don't get any free active shutter glasses with the TV.